A sharply styled instrument that's just what a parlour of this price should be. Excellent specs. Superb value for money. Looks great. Top-end is a tad shrill. Tuners got a little stiff. There's a nicely detailed slotted headstock with individual open gear nickel-plated tuners. Classy stuff. We last caught up with a couple of Alvarez Masterworks series guitars back in early 2014: two mid-range electros, the MP70E and MG75SCE, which suitably impressed us. Here, we have a lower priced, vintage-flavoured parlour acoustic from the Artist range: the AP66SB Artist 66 Parlour. Our parlour guitar is a fairly conventional small size, comparable to Martin's 00, not too deep but not over-shallow either. 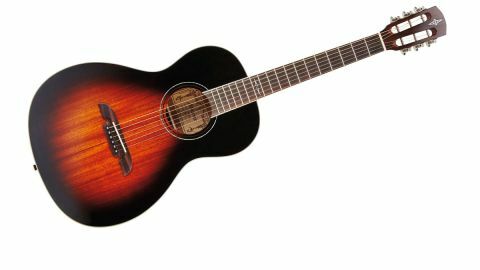 It certainly has a vibe, with a solid African mahogany top, deep Vintage Sunburst, cream binding and abalone ring around the soundhole. "If you play sitting or you slouch into your sofa, the parlour is a cosy, even comforting instrument to get your arms around"
The finish is pretty glossy and not exactly old-school authentic, but you can't help be attracted to its 'Depression-era' style. The laminate mahogany back and sides are pleasantly figured, too, and overall it's very nicely put together. The three-piece mahogany neck has a comfortable C profile, which is not exactly slender but still inviting to the thumb-over player. It's topped with a nicely inlaid slotted headstock with open-backed Waverley-style tuners in keeping with the old-time style of these guitars. Neatly fretted, the rosewood fingerboard is fully bound, and we only have side-placed dot markers leaving the fingerboard face clean aside from a 12th fret inlay that seems, stylistically, at odds with the rest of the instrument. It also features Alvarez's 'bi-level' rosewood bridge. The saddle is elevated above the level of the bridge pins creating a sharper break angle, ensuring good contact and downward pressure of the strings over the saddle. "We're invited to country blues voicings or slide, but without the barking resonator-like projection of some"
If you play sitting or you slouch into your sofa, the parlour is a cosy, even comforting instrument to get your arms around. Fans of 12 fret guitars believe (and many makers would agree) that they tend to have 'richer' tone than 14-fret designs because the bridge sits more centrally in the lower bouts. Understandably, with the parlour's smaller, shallower body, the '12-fret effect' is less noticeable than on a dreadnought, but then again it has a hardwood mahogany top to factor in. The midrange often defines the voice of a guitar of this size and here we're invited to country blues voicings or slide, but without the barking resonator-like projection of some. It's actually a sound that's very at home, at home. Being picky, it's in the top end where it lacks a little sophistication. When strumming gently with a pick, some of the richness falls away leaving the instrument sounding a tad shrill. Intonation, though, is excellent and it handled drop D tunings without fret buzz although the power and low-end definition of the dread suffered down in C.
This guitar is enormous fun. We couldn't help but feel that it is astonishingly good value for money, too. Sometimes, as punters, we all look at the prices and the specs of instruments and make a conclusion: this not only ticks the spec-versus-price box nicely, but also feels and sounds as though it's punching above its price.